Before you choose a bird bath, it is important to understand how many different types of bird baths are available. With many different designs, sizes and decorative styles, there is a bird bath suitable for every birder’s garden. There are several basic types of baths that can be purchased in a wide range of styles. Ground: A ground bird bath is the simplest model and is nothing more than a basin that rests on the ground. These birdbaths can easily be created from shallow dishes or more elaborate models with dripper or fountain accessories are available. Ground birdbaths are essential to provide water to large birds such as quail and ducks, and many smaller birds will also visit lower baths. Pedestal: A pedestal birdbath has an elevated basin but the entire bath stands on the ground. These are quick and easy models to assemble and install, though they can also be bulky. Because pedestal models are the most popular, they come in the widest range of design styles. Hanging: A hanging birdbath is a shallow basin suspended from a cord or chain that is meant to be hung from a gutter, tree branch or garden hook. These models are generally less expensive than pedestal birdbaths, but they also have a smaller capacity and come in fewer designs. Fountain: A fountain birdbath features moving water in addition to a shallow drinking or bathing basin. The moving water may be a bubbler, spray, or gravity-powered dripping fountain. These are excellent choices for attracting birds with water, since the noise of the water and the movement make the birdbath more noticeable. Heated: Many birders in cooler climates opt for heated birdbaths. While birds can use caloric energy to convert snow and ice to water, having an available source of liquid water allows them to use that energy for heat and survival during cold winters. Heated birdbaths do not create warm water, but generally keep it from completely freezing. Sophisticated models include thermostats for energy efficiency and regulated use. Solar: A solar powered birdbath has built in solar panels that provide energy either for heating the water or to add movement through a bubbler or fountain. In some models, the solar panels can be removed if desired. These are expensive birdbaths but can be dynamic additions to a garden. Which construction material you should choose for a birdbath is largely a matter of personal preference. Some materials, such as ceramic and glass mosaics, are more delicate than sturdier materials such as concrete and plastic. 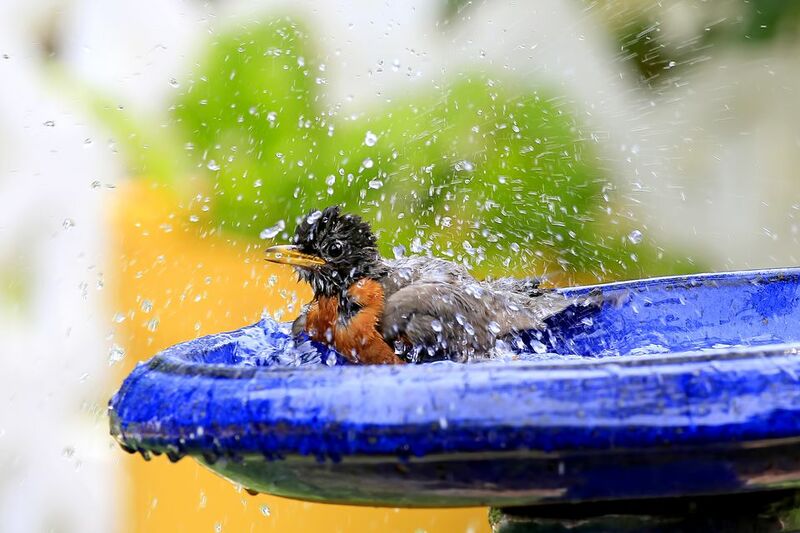 Birders who have other decorative elements in their garden, such as multi-colored gazing balls or concrete statues, may prefer certain birdbath materials because they match the existing accents. Some birders also prefer to choose materials based on their weight, especially to make cleaning and relocating the birdbath easier. Lip Width: A wider lip offers more perching space but has a less delicate appearance. Depth: An ideal birdbath is 1-2 inches deep, but some models include shallow islands or edges for more depth variety. Color: Birdbaths are available in every color. Natural earth tones and water-related shades such as blue, white and aqua are particularly popular. Shape: Round birdbaths are by far the most common, but square basins are also available. Leaf and shell shapes are popular for smaller baths. Sculptures: Many birdbaths feature decorative carvings and sculptures on the pedestal or edge of the basin. Popular designs include leaves, flowers, butterflies, small birds, turtles, fish or other related accents. More whimsical designs may even resemble cats. For many backyard birders, the ultimate deciding factor among types of birdbaths is the cost. Simple, basic birdbaths can cost as little as $15-20, and many birders and gardeners can make their own birdbaths for even less. More elaborate designs, including solar birdbaths and fountains, can cost $200 or higher depending on their size, style and features. Understanding the many types of birdbaths available can help both birders and gardeners choose the best birdbath for their personality, garden décor and budget while still providing a valuable water source for all backyard birds.